Work continues on the prototyping. Here we've got our first basically complete model. It's got a candidate paint scheme, is filled with flexible polyurethane foam, and is based with a thin layer of EVA foam. None of this is necessarily final. In fact, we're pretty sure we're not going to go with the EVA foam base. It's not very tough, seems to soak up liquids, and just generally doesn't have a good feel to it. Being waterproof is a key criteria for us - neither Coke nor beer nor showers of rain nor sweaty palms shall damage this game terrain! I really like the colors, we're definitely going with a "sandstone" brown scheme initially instead of the traditional "granite" gray. Gray terrain is just so... tired. 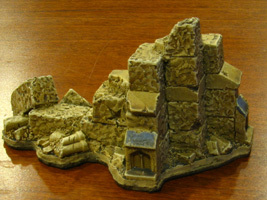 Here's a another terrain piece we have cooking (not anywhere close to production, this one). This is the color scheme we're shooting for: basic sandstone brown with nice highlighting and shading, slate blue roofing tiles and possibly other details picked out. 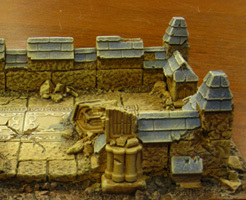 Something that looks great, is relatively quick and easy for us to paint, and isn't so busy that it competes with your miniatures visually on the table.